Before I left the U.S. for Denmark in August of 2008 I knew nothing about Danish cuisine. I’d never even heard of rugbrød, a dark, sour-dough rye bread which is the consummate Danish food. Just ask Oprah Winfrey. After her visit to Copenhagen last fall she returned to Chicago with multiple loaves. She said it tastes like “eating a piece of the earth.” I’m with you, Oprah, but more about rugbrød later. My goal is to give you a glimpse into the Danish diet, what a typical BLD consists of, and present some observations about food in this Nordic country. It’s important to note that while the foods I describe typically appear in the average Danish diet, they by no means represent what all Danes eat. For instance, younger and/or more affluent people–and those in larger cities–are increasingly eating out more and purchasing and preparing food with Italian, French, American, and Mexican influences. I’d also like to mention that I will not be covering any Danish holiday food. 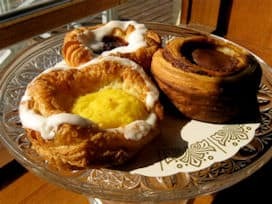 Danes have a strong tradition of eating special foods at particular times of the year, and I could devote an entire article to Danish holiday food. It might include cold cereal such as cornflakes, muesli, Rice Krispies, Coco Puffs, or Frosted Flakes, among others. Contrary to the massive offering of breakfast cereals in American supermarkets, Danes have a relatively small selection from which to choose. That’s in large part because most Danes eat bread for breakfast. Typically, white bread slices or rolls with various toppings: cold cuts, slices of raw veggies, white cheese, butter, and jam. Danes are crazy about bread topped with a slice of mild, white cheese and a spoon of strawberry (or other type of) jam. 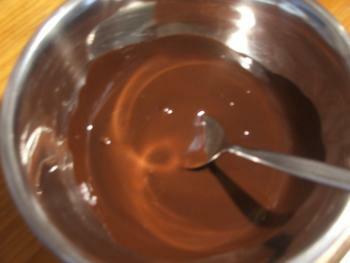 Chocolate is another popular topping. In addition to cooked oatmeal, Danes are also known to eat dry, uncooked oats with milk or yogurt mixed in. 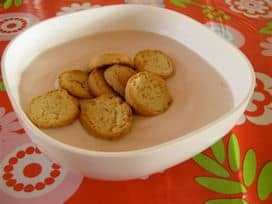 There’s also something uniquely Danish called kammerjunkere, which reminds me of a thick vanilla wafer. People here add them to a dish of yogurt or ymer, a thick buttermilk, and eat that for their morning meal. Danes do not eat out for breakfast, unless it’s at the home of friends or relatives. I’ve lived in two different towns in this country and am not aware of a single breakfast establishment in either place. My understanding is that it’s becoming increasingly popular to eat brunch out on the weekends in the larger cities, but the trend hasn’t made it to our town yet. Going out for breakfast is one of the things I really miss about living in the U.S. But it’s simply not part of the culture here. In case you are wondering, the sweet breakfast pastry that Americans call “Danish” is referred to here as wienerbrod (or Viennese bread). It comes in many varieties and is generally reserved for special days, weekends, and corporate breakfasts. Finally, in terms of beverages, coffee is pervasive in Danish homes and work places. What’s more, Danes drink upwards of 20 million cups a day, according to the Danish Tourism Bureau. Juices, tea, and milk (including chocolate) are also common. Well, that depends on whether you bring your lunch (madpakke) or eat in a work place cafeteria, the two most common forms of obtaining lunch. The cafeteria offers hot food as well as a salad bar and other selections, depending on how elaborate or large it is. What I find amazing about the packed lunches is that the majority of people bring nearly identical items. That’s because the Danes have a strong tradition of smørresbrød (a close relative of the Swedish smorgåsbord), which translates to butter and bread. 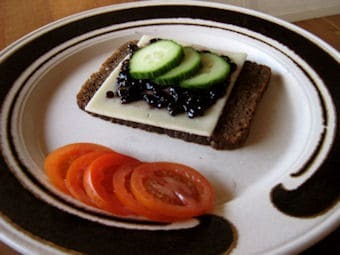 In general, smørresbrød is buttered rye bread served open faced with a variety of “pålæg,” or toppings. Some of which include cold cuts, liver paté, fish spreads, laks (smoked salmon), frikadeller (danish meatballs), cheese, and so on. The Danes I’ve observed include a substantial amount of veggies in their lunches, too. Sliced red pepper on top of smørresbrød, raw, whole carrots, cucumber slices, and tomatoes are all popular. 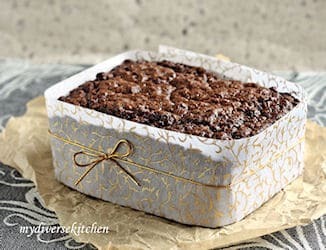 There isn’t necessarily dessert in a packed lunch, but there might be a piece of buttered rugbrød with a thin slice of chocolate, called pålægschokolade (pictured in the photo above under “What’s for Breakfast”) or perhaps a slice of leftover cake. More often than not, you will find Danes eating a piece or two of whole fruit. Apples and pears are common as are seasonal fruits such as berries and plums. 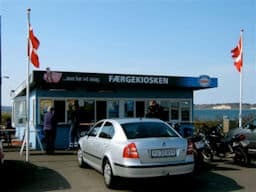 The closest thing to fast food is the pølsevogn, or sausage wagon. 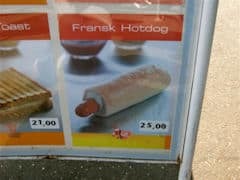 It’s a hot dog stand, and Danes are head over heels for hot dogs. Unlike the U.S. where dinner time is anywhere from 5:00 p.m. to 8 or even 9:00 p.m., the majority of Danes eat at 6:00 p.m. every night. Dinner out at a restaurant or someone’s house might be different, but I’ve noticed that during the week, 6:00 p.m. is the official family dinner time. If I were to describe, in general terms, a typical dinner it would consist of pork roast, boiled potatoes, gravy (Danes call it brown sauce), and steamed green beans. Of course there are hundreds of other items that comprise the Danish dinner, but this is quite representative of what a Danish family would sit down at the table for. Fish, seafood, and meat are prominent parts of any traditional Danish dish. Cod, eel, herring, salmon, and shrimp are popular, as are other types of fish used to make fried fish for smørresbrød and fish frikadeller (fish meatballs). In terms of meat, Danes consume a lot of pork and more pork than beef. I’ve heard that they eat more pork than that of any other country in the world. Popular choices are pork roast, pork tenderloin, ham, pork cutlets, and ground pork, used to make pork frikadeller. Chicken and turkey are increasingly popular. I cannot overemphasize the value of the potato in Danish cuisine (and the greater Danish culture for that matter). Potatoes are considered an essential side dish to almost every hot meal. I have a Danish friend whose father is so addicted to potatoes that he eats them at every meal and was afraid to attend his daughter’s wedding in South Africa for fear he’d be without his most prized food. Danish potato recipes abound. There are countless variations of baked, boiled, fried, mashed, au gratin, and so on. Typical dinner vegetables consist of cabbage, carrots, creamed kale, spinach or white cabbage, cauliflower, pickled beets, Brussels sprouts, green beans, and peas. I haven’t tried it yet because I can’t quite get over the way it looks overly processed, but there is a very popular dish called “Tarteletter med høns i asparges” that is a thick white gravy with canned white asparagus (and often chicken) served in a fluted-edged puff pastry shell. The Danes love it, and there must be some reason why it’s so popular, but I’m just not there yet. Ice cream might well be the most common dessert. Many different ice cream novelties and cakes are available in supermarkets, quick marts, cafés, and pølsevogns. Other desserts: rice pudding, crepes with sugar inside, fruit salad, and various cakes. When I first moved here I couldn’t get over the enormous popularity of gummy candy, black liquorice (often salty), and marzipan. Chocolate is also celebrated, but that was expected. The markets are full of many different varieties of gummy candy, and there is even a special tradition around them. On Friday nights, most Danish kids are allowed a bag or a portion of a bag of gummys while they watch special weekly cartoons on TV. Around the holidays all sorts of marzipan sweets abound. The most common is a piece of chocolate with marzipan inside, for instance, an “egg” for Easter and a “snowball” for Christmas). 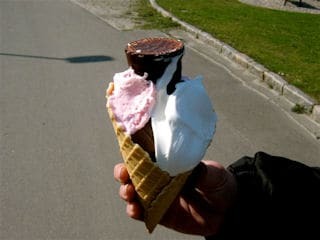 I would be remiss in not mentioning the vast presence of soft serve ice cream in Denmark. Last summer, my family (my husband is French and our son is French-American) developed our own Friday night tradition. After work, we’d hop on our bikes (with our son in the bike trailer) and ride to the local ice cream shop next to the harbor overlooking the fjord. My son and I would order “soft is” while my husband passed up the ice cream in favor of a beer. Yes, most ice cream shops serve beer, too! They also serve hard ice cream, but the soft serve is amazing. Delicate, smooth, and creamy, it is truly outstanding. Plus, it’s just the right amount of sweet. 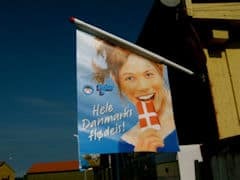 I often find ice cream cloying in the U.S., but the Danes have got it right. 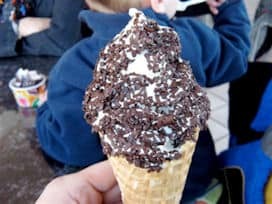 Served in a cone (generally a waffle cone) or a cup, it’s topped with your choice of sprinkles and, if you’re up for it, a flødeboller (akin to a Mallomar cookie), guf (sort of like marshmallow cream but typically strawberry flavored), and whipped cream. Junk food is ever on the rise here. The selection is slimmer than in the U.S., but there are still loads of different chips, crackers, cookies, french fries, soda, and so on. 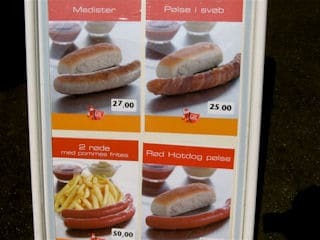 My impression is that most Danes indulge in these foods periodically but eat healthfully most of the time. They do better at consuming them in moderation than their American counterparts. That being said, I see lots of teenagers carrying around bottles of Coca Cola, chips, and candy. I suppose teenager habits are universal. Balancing out the availability of unhealthy items is a substantial amount of organic food available and community supported agriculture (CSA) cooperatives. Our family shops organic when we can (the vast majority of items are reasonably priced) and subscribes to a CSA that gets us a box of fresh, organic (“økologisk” in Danish) produce once a week for just under $40. Also, my husband is a big fan of the wide selection of Danish økologisk beer. There are a number of brewing companies, and beer is extremely popular. Hard cider is celebrated, especially among the younger set. Wine is very common, widely available, and in all different price ranges. Akvavit is Denmark’s own hard liquor, a snaps made from distilled potatoes and herbs, but is too strong for my taste. Alas, other types of hard alcohol are either scarce or prohibitively expensive. For a recent Mexican-themed lunch I just assumed I’d be making margaritas. That is until I went to price the one brand of tequila I could find, and it was close to $80 a bottle. Gulp. I was so disappointed, but our family budget does not include an $80 bottle of liquor. On the up side, red wine is cheap, so there’s always sangria. Cheers, or, as the Danes say, “Skol!